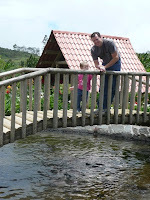 While taking a drive near the Turrialba volcano, we came across a little jewel of a restaurant. 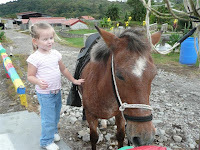 It's actually very family oriented with a playground area, pony ride, farm animals. On top of it all, it's a trout farm with thousands of rainbow trout from fry to what appear to be 4-5 pounders! Needless to say, the restaurant's specialties all center around trout dishes! 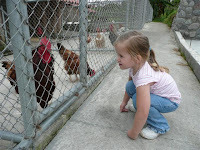 Jordan was fascinated with the pony and the chickens and she enjoyed feeding the fish. 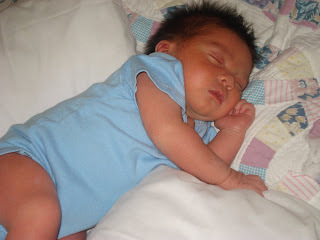 On August 22, our good friends, Fernando & Jannina, had their first son! We are so happy for them! Jannina wrote that they’d named the baby “Fernando (for his father) Enrique (for Henry).” What an honor! Our plan had been to visit them this month to meet little Fernando Enrique, reacquaint ourselves with his 2 year old sister, Gloria Kristine, and see just how much 9 year old Janina Michel, the oldest, had grown, but the political situation in Honduras has made it impossible. We are so anxious to see and hug all of our dear Honduran friends again! Please join us in praying that we will be able to visit them sometime soon.